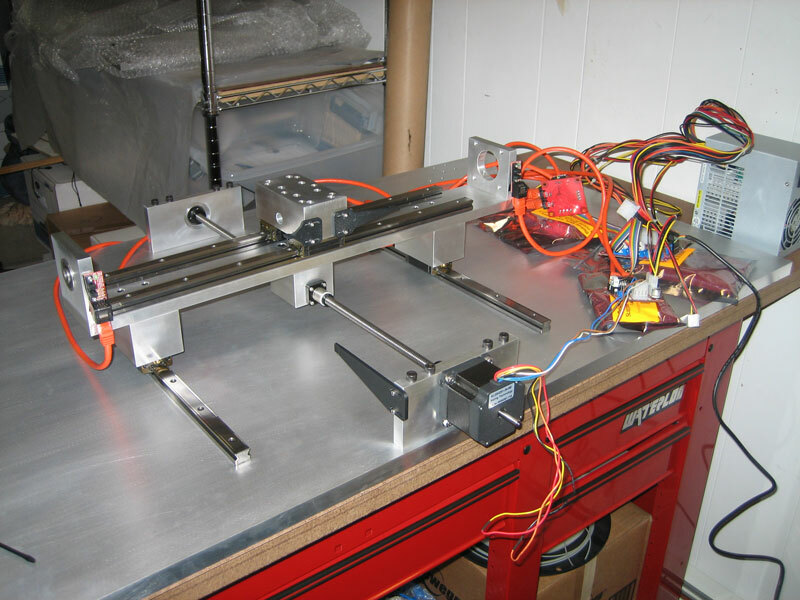 Once the X axis had been assembled and tested, it was straightforward to get the Y axis completed. The End Stop flags were adjusted on each axis to give enough clearance so that nothing will crash into each other in the event of a software error. The Orange Cat5e cabling in the above picture is simply used to connect the end stops to the stepper motor drivers. The Build Plate fastens directly into the Y axis carrier block. 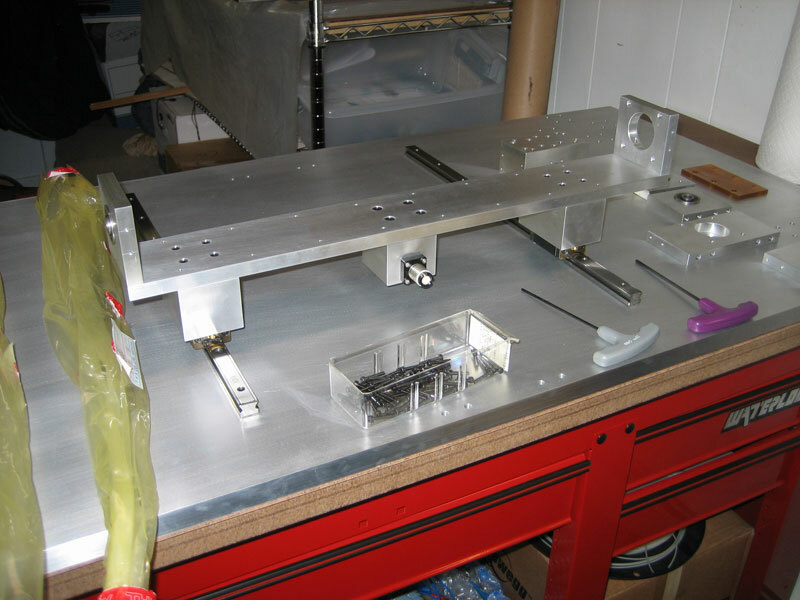 During test runs of both axes, the build plate was checked to make sure there was no excessive vibrations due to its size and the fact that it only is secured in the center. The RepRap 3rd Generation electronics made it fairly simple to get the axes moving once ReplicatorG was configured for my machine. This basically consisted of calculating the travel of an axis in mm per step of the stepper motor. I used Skeinforge to slice a simple test part and then ran this code with ReplicatorG to test the movement of the axes under simulated print conditions. 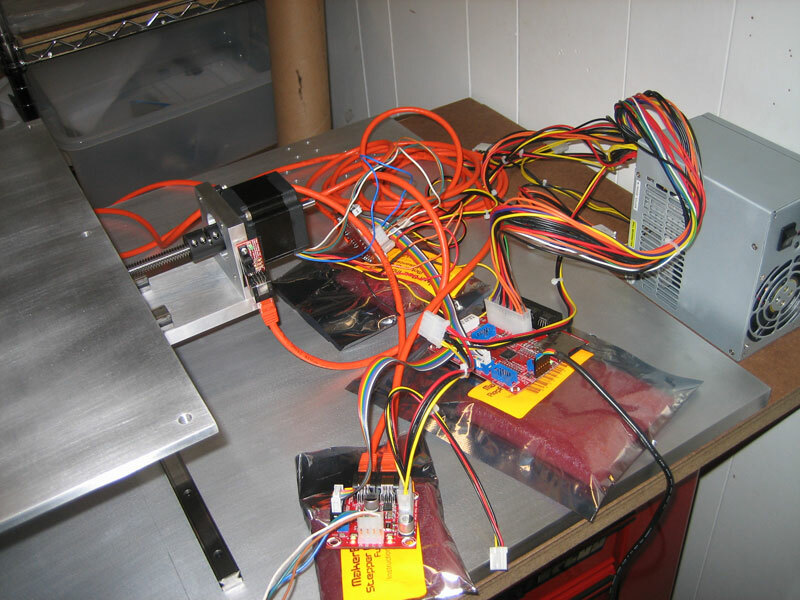 In the above image you can see the micro controller and two stepper motor drivers, all powered by the standard computer power supply. Above you can see the ACME lead screw with the anti-backlash nut. The thread size initially was 3/8″-12, 1-start on all axes (as pictured here) but was later changed to 3/8″-8, 2-start. This increased the speed of the X and Y axes three fold. It is attached to the NEMA 23 stepper motor via a shaft coupling. This shaft coupling has one side threaded in order to better secure the acme screw. You can see in the the below image that that on the other end of the acme screw there is a shaft collar which is pressed right up against the bearing in the bearing mount block. There is also another shaft collar pressed up to the other side of the bearing. What this does, is it takes a majority of the load off the smaller internal bearing in the stepper motor and puts it on that big 3/8″ bearing, thus reducing wear on the motor. Testing of the X axis with the 3rd generation RepRap electronics was successful. As you can see in the pictures there are optical end stops at each end of the Y axis. 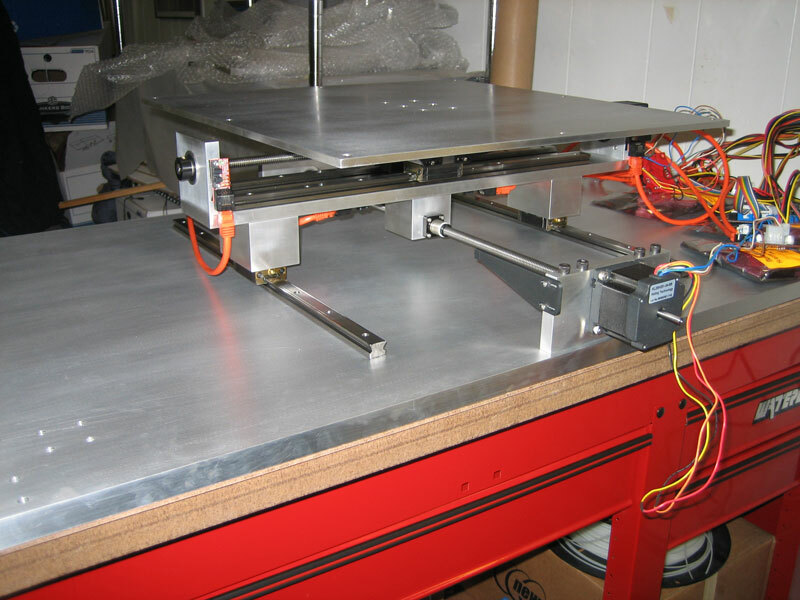 The end stops for the X axis are actually mounted on the underside of the Y axis. The flags for the end stops are the adjustable black plastic parts that were actually printed on a commercial 3D printer. I could have printed them on the machine itself once I got it running, but I did not want to take the risk of having no end stop protection until then. Next up was assembling the X and Y stages. These stages are stacked on top of one another. This configuration does lead to some tolerance stacking issues when squaring the build plate to the Z axis. I will cover that more in a subsequent post. The Y axis stage was fastened to the linear bearing blocks with aluminum spacer blocks in between. 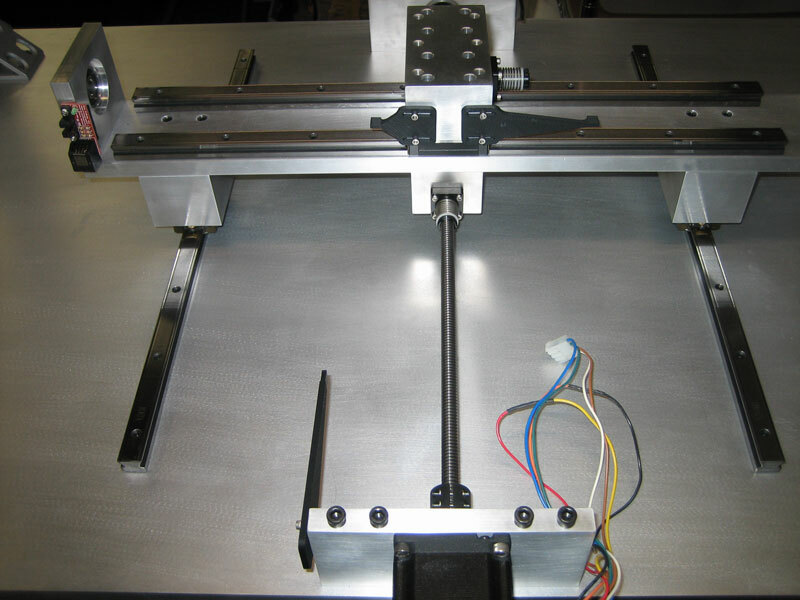 This spacing provides just enough clearance for the X axis motor and lead screw. I wanted the X and Y axes to be seated as close to the table as possible because as the further these stacked stages are positioned off the base table, the more vibration and tolerancing issues will occur. In the center of the image above, you can see the anti-backlash ACME nut mounted to its respective block. All through holes for screws are counter bored in the Y axis plate to allow for enough clearance of the Y axis linear rails. On the left is the bearing mount block and on the right is the NEMA 23 stepper motor mount. Once the Y axis stage was secured, another matched set of linear ball bearings were attached. The spacing of these rails is much smaller than the X axis rail spacing. This decision was a balance between the stability of the build plate (further apart = more stable) and the axis maximum travel. The Y axis carrier block is fastened to the two rails and the build base will be attached to this block. 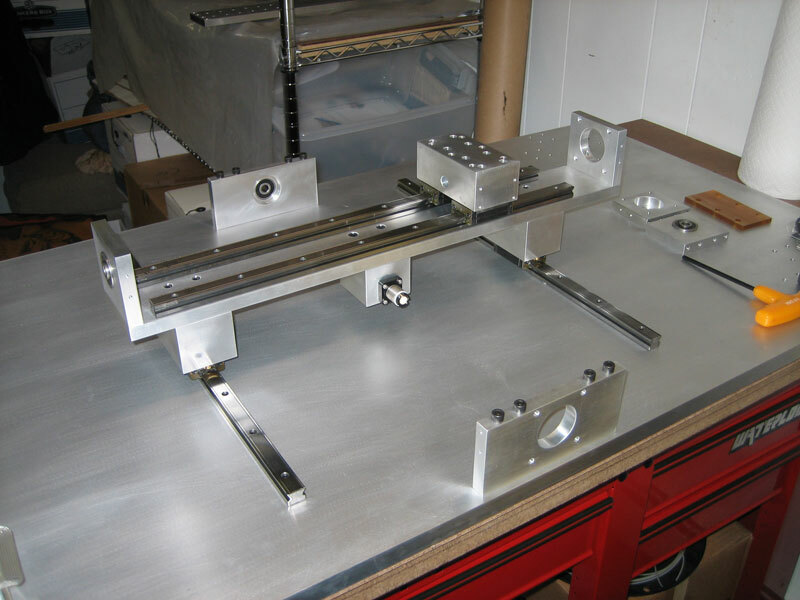 The X axis NEMA 23 motor mount and bearing mount block are fastened directly into the aluminum table.